Red Dead Redemption 2 – Red Dead Perfection! Red Dead Redemption 2 has been in development for 8 years, which is a really long time, but in those 8 years Rockstar created what is arguably one of the best games currently available. Red Dead Redemption 2 takes the dirty and disgusting western time period and turns it into a sprawling immersive wonderland with the most living open world that has ever been created. Red dead Redemption 2 is a prequel to the 2010 Red Dead Redemption. In RDR2 players will step into the opinionated and, at times, rude, Arthur Morgan. Along with his merry band of outlaws you will find yourself hiding out in the snowy mountains at the start of RDR2. Here you meet a much younger but no less miserable Jon Marston. This is where the magic of Red Dead Redemption 2 starts. Most open-world games have you exploring the vast and sometimes lush map and when the urge strikes you can head over to the nearest town, look for a large glowing icon above a NPC’s head and start a mission. This is where RDR2 starts its transformation of what the standards for future games should me. In RDR2 nothing feels scripted. missions, side missions, treasure hunts and everything in between, just happens. At no point does anything feel planned. While happily taking a ride through nature you might stumble across a damsel in distress, or a man needing help with his horse’s shoe… The world of RDR2 doesn’t stop if you are not interacting with it, take some time to observe the NPCs and you will find that even the wildlife go about their lives. on many occasions I found wolves hunting deer, bears fishing in the river, or wolves cornering a unsuspecting bear. No game EVER thus far has created a living world like the RDR2 world. If you tell 10 people to go and explore the world of RDR2, chances are that none of them will experience the same things while out and about. With many open world games the novelty of travelling and exploring the mountains and rivers quickly wear off. This is one of the ways Rockstar forces you to explore the world they created. In RDR2 one of the controversial talking points have to be the interesting take on fast travel, with the fast travel system only unlocking further into the game and being slightly limited can be negative to some wanting to rush through the game but this way you are forced to take to horseback and explore the wonderful world that has been so meticulously crafted! 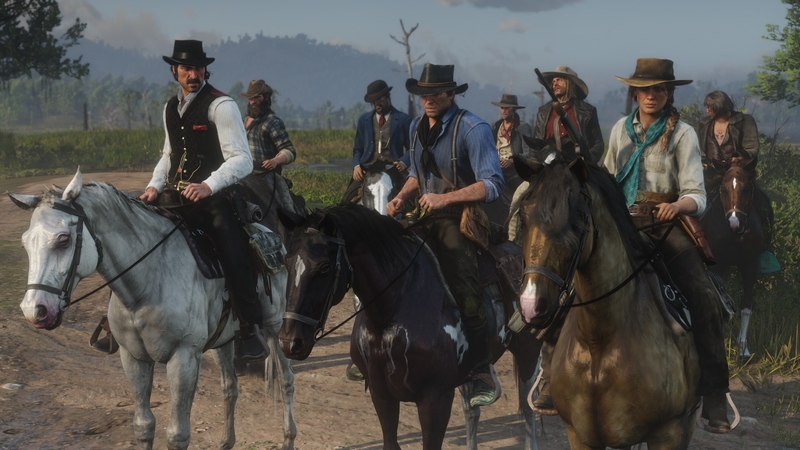 Apart from the vast open world and many things to encounter, RDR2 offers a ridiculous amount of scripted missions, 104 missions to be exact. To put this into perspective, GTA 5 only had you taking Michael, Trevor and Franklin on 74 scripted main missions… Let that sink in. In RDR2 you will spend your 104 main missions sheriff-shooting, bridge-blowing, bank robbing and the lone “follow the objective”. The main missions all have a large part in story- and character building which all happens in the craziest of ways such as inventive tasks, costume changes, outrageous modes of transport or peacefully teaching a boy to fish. Storytelling in RDR2 once again shows why Rockstar took their time with this title. Many AAA- titles with large production budgets and massive teams working on them still churn out rather predictable storylines with plot-twists that can be spotted from miles away. RDR2 takes the standard of modern story telling and pushes it even further. CD Projekt Red and the Witcher 3 was arguably the best story telling around, except maybe for The Last Of Us. RDR2 makes both those titles look normal. The tale of Arthur Morgan takes ambitious twists, and the epilogue is nothing short of astounding. Lesser games will use side missions as a way to justify charging you a large sum of money for a lackluster story. RDR2 takes side missions to the next level by making each of them worth your time. Animal hunting alone involve tracking scents and clues before targeting your preys’ vital organs for that clean kill. The hunting in RDR2 alone is more engaging than all of the Cabela’s games combined. 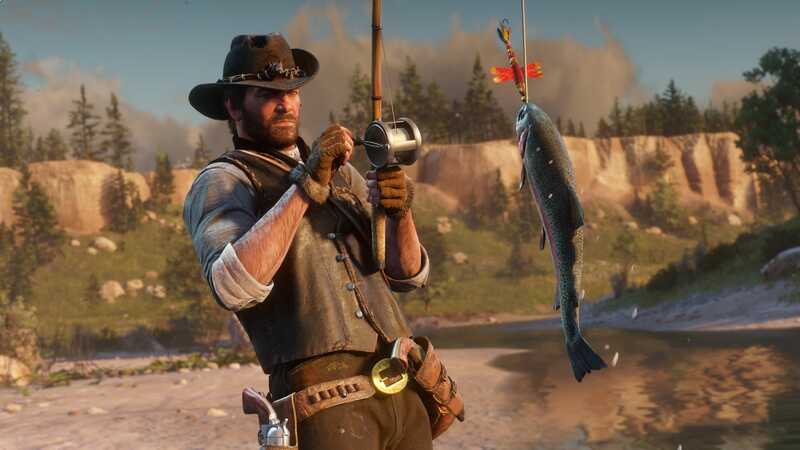 Apart from supplying your camp with food via fishing or hunting, you can also use your resources to upgrade certain parts of your camp which offers a management aspect to the game as well. The camp supplies is not the only thing that needs to be managed. Arthur needs to eat, drink, sleep and bath if he wants to be the best sharpshooter he can possibly be. Hair and beards need to cut and trimmed and once in awhile Arthur needs to take a bath otherwise the townsfolk will not want to interact with Arthur. 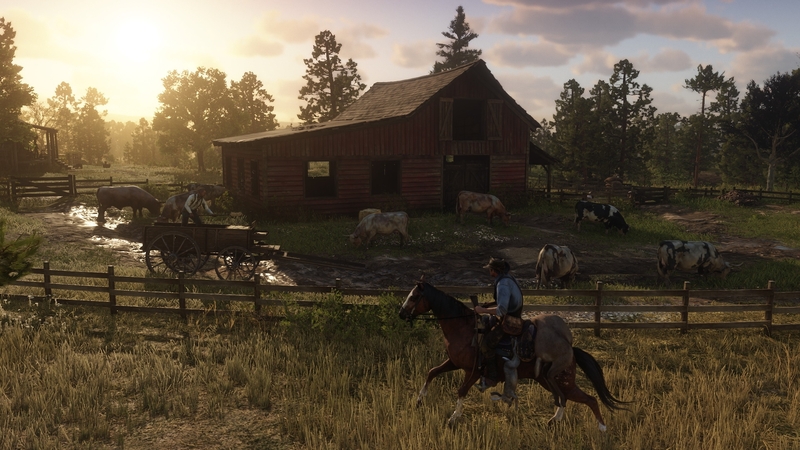 Rockstar has also added some finer details, not only to the astounding world which ranges from the snowy mountain tops, the open plains with herds of bison and wild horses grazing everywhere to the swampland infested with alligators or the towns where every brick has been detailed and every NPC has a story to tell. Rockstar has also brought a companion app that can be used on IOS and Android devices which even further enhances the immersion. With the opening of maps being rather cumbersome, using the app allows you to have a live map next to you at all times, not only does this help you, turning your in-game map off will see your partners or other NPC’s give more descriptive directions as to where you need to go. The physics that has gone into RDR2 is simply astounding, walking through snow sees the snow adjust and fall to the way you manipulate it. Ride through thick brush and the branches will move and bend as well as having Arthure flinch and adjust. These little things is what takes RDR2 from being a great game to a Perfect game! RDR2 currently has no multiplayer function with the beta going live later in November but if it is anything like what we experienced in Red Dead Redemption and GTA 5 it is sure to be wonderful! Truth be told, words do not describe Red Dead Redemption 2. Walking through your camp, stopping to play cards with your gang members, that is RDR2. Wanting to provide food for the camp, that is RDR2. Grooming and feeding your horse, not because you have to, but because you want to, that is RDR2. Taking the time to sit around the fire and listen to the stories your gang has to tell, that is what RDR2 is about. Red Dead Redemption 2 takes what other games offer and makes you feel like you want to do it, not that you have to do it. From the moment the first cutscene starts to the moment the credits roll, which hopefully isn’t soon, you will sit with a childish grin on your face. Is this the best game of this generation? The Witcher 3 stood head and shoulders above all other games owning that title, but it now has a partner alongside it as arguably the best game of this generation. But with that comes a ominous toll of the bell, similar to when GTA 5 was released, does this mean the end of this generation is near? But until then we can bask in the glory of Red Dead Redemption 2! Still not convinced have a look at the launch trailer here.